Join us at the magic hour, for a spirited trek around the neon delights of Las Vegas. Enjoy classic cocktails and hear stories about the rise of this legendary city as we take a stroll down historic Fremont Street, gazing up at remarkable displays of dazzling neon. By the end of this tour, you’ll know why Vegas is internationally renowned as the entertainment capital of the world! 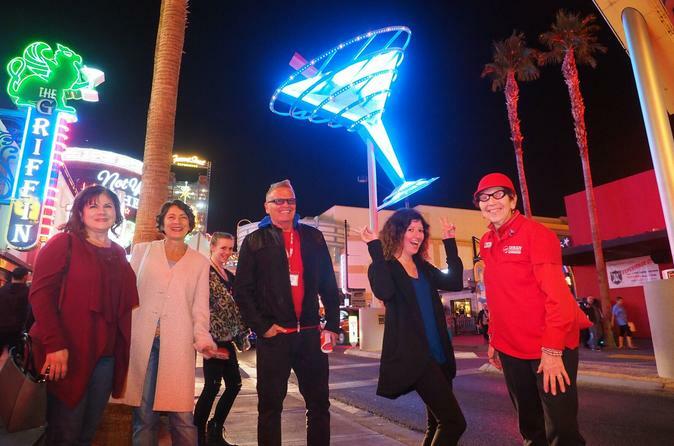 Neon, cocktails and the lore of Las Vegas are the order of the day on this entertaining downtown evening walking tour, full of spectacle, punchy stories and fun! Our journey begins in the Fremont East neighborhood, in the Parlour Bar of the old El Cortez (of Bugsy Siegel fame) for the first cocktail of the evening. It’s a trendsetting district of entrepreneurs, murals, artsy bars and cozy restaurants. Next up, your guide will show you a collection of new-ish street signs — inspired by the classics, that demonstrate how neon has its own language unique to Las Vegas. You’ll hear a story about the Neon Trail and how the famous “Welcome to Las Vegas” sign connects to Downtown and the Neon Museum. Over on 4th Street, Neonopolis and Slotzilla have their own stories to reveal — on a plaza offering thrill attractions like a zipline and escape room. Then we’ll make our way towards the thrilling Fremont Street Experience, the historic four blocks of the original Strip that began in the 1930s with legalized gambling — and is still home to 10 storied casinos. Today, the street is a vast pedestrian mall that can boast having the largest video screen in the world, 90 feet above the street, with shows on the hour. Fremont is an urban carnival where everyone performs, including the madcap buskers and flair bartenders. Your guide will navigate the street, pointing out little-known facts, local folklore and the sites of memorable movie scenes. But the main attraction is the neon — miles and miles of it, forming part of the legendary electric architecture of Downtown. Finally, we’ll arrive at Main Street, the place where Vegas began as a dusty railroad stop over a century ago. Once the historic train station, it’s now the site of the Plaza Hotel. We’ll make our way to a famous speakeasy of sorts run by a legendary former Mayor, in an enviable historic and lofty spot with impressive views of Fremont. We’ll offer you a cocktail and toast our time together and say “cheers” to the enduring story of neon in Las Vegas. Your tour ends here but doesn’t forget to ask your guide for more tips on what else to see and do during your stay in Las Vegas.